As 2011 comes to an end, I would like to wish everyone a healthy and prosperous New Year. In 2011 I embarked on a journey to fulfill my life's passion and though the road has not been without its share of potholes, detours and roadblocks, I am still happy with my decision. Here's hoping that 2012 will be as inspirational and productive for all of us and may everyone take the opportunity to follow their dreams wherever they might lead. Chapter four of "At Second Sight" is almost complete. Thomas has found himself thinking fondly about Mrs. Dean and the power gifts she bestowed upon him in "Not Forgotten". He has also used a Jimmy Redbush quote when speaking with Detective Jack Bronson. It's like meeting up with old friends! Thinking about adapting my lovely garden statue for the cover design of "At Second Sight". Would you find a cover like this enticing? The truck rolled slowly on to the black top path that led through the cemetery gates. Lilly bowed her head. She hadn’t been here since the funeral and was suddenly feeling a bit guilty. The cemetery started out as a small roadside graveyard almost two hundred years ago and expanded inward through the years so the dates on the headstones became more current the further they drove. The older section always made Lilly uncomfortable. She could feel the eyes of the dead looking at her as they passed the monuments and tilted stones. The hairs on her arms stood up and she felt a shiver on the back of her neck. Kyle slowed to an awkward halt at a fork in the road. He hadn’t been back since the funeral either and was not sure which way to go. Lilly looked up and pointed to the left. Embarrassed, Kyle turned and proceeded up the hill. As they approached Tony’s grave site, they saw a figure seated on the stone bench on the other side of the road. The small, frail woman was sitting alone, waiting. Her question left unanswered, they both exited the truck. “Hello?” Lilly said as she approached the elderly woman. The woman nodded her head and slid from the middle of the bench to one side, inviting them to sit. Lilly took a seat on the bench. Kyle, freaked out by the air of prophecy and supernatural wisdom which seemed to shroud everyone in the situation except him, elected to stand. In the event that a fight or flight response should be deemed necessary, he wanted to be certain of a swift retreat. The old woman spoke to him first. “Hello boy. You can sit. I don’t intend to bite you. Not today anyway.” She smiled a broad grin and chuckled at her own pun. Kyle stuttered, “No. I am ok. I sat in the car.” Then scratched his head befuddled by his own ridiculousness. “Oh well, then, plenty of time to rest when you are dead.” She seemed to drift away from them momentarily as she spoke these words. 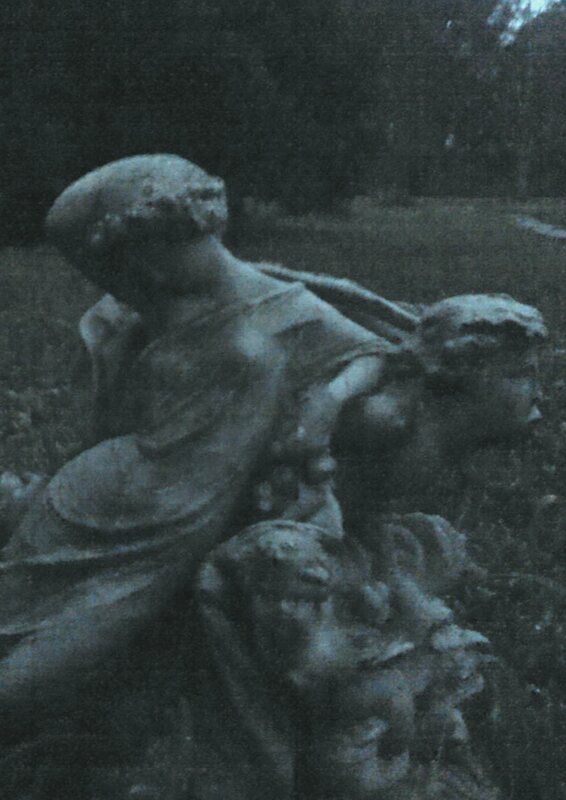 Her unseeing gaze focused toward the front of the cemetery. The woman’s face seemed to gray and wither a bit as she listened to his rant. She repositioned herself on the bench as though she were readying herself for a spotlighted soliloquy. Lilly felt an odd tremble run down her spine and as it ended at the base, she became a bit light headed. Kaitlyn is also working on murals in her bedroom. 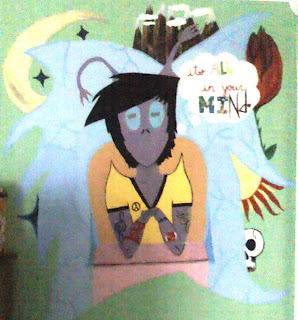 Here is the first. I had to share this picture. 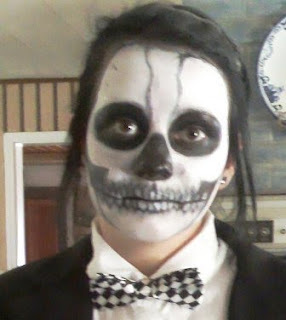 This girl can do anything when she puts her mind to it and apparently that includes makeup. Thomas Lynch is an interesting guy but his character does not develop much in Not Forgotten. That's why he will be the featured character in my next book; working title: "At Second Sight". Thomas is the smartest person in the room. He is logical, rational, and knowledgeable on many subjects. He has a photographic memory and retains just about everything he reads and sees. As might be expected from someone who thinks atypically, his social skills leave much to be desired. Thomas was the skinny, smart kid in your high school that didn't fit in and was instant jock bait the moment he entered the room. Misunderstood, he was picked on and ridiculed for most of his life. Thomas feels like a disappointment to his parents even though he graduated high school and began college two years early. His father was a high school jock and expected to have a son that would inherit his athletic prowess. Though he has tried, he has never been able to bond with Thomas. They are almost like aliens from opposing planets. As if being a socially retarded genius wasn't enough of a challenge, Thomas is also psychically intuitive. He has seen apparitions and had premonitions but these things were rare and uncontrollable for him and his inability to control them has led to frustration for him. Confused, he made the life changing decision to attend a seminar on parapsychology given by David Dean. Meeting David, his mentor and father figure, changed his life. It is Davids' mother who helps Thomas unlock the mystery of his abilities and become a very proficient psychic. Thomas will embark on a side career apart from the Highgate Paranormal Research Society and his mentor David Dean. It is in this side career where we will get to know him better and witness his metamorphosis as a character. Not Forgotten has received its first reader review on Amazon and it is a 5 STAR! I was so excited when I saw it. It feels wonderful to know that people find entertainment value in the things that you work so hard on! For me, writing a book is almost like creating a world full of people that I have created. I can be a bit protective of them and become very emotionally involved in their introduction to the world. It is a fantastic feeling when other people like them! I am tossing around the idea of making Thomas a lead character in his own work. He didn't play a very significant role in "Not Forgotten" after all and he is a young psychic with a bright and exciting future on the horizon. Yes, the more I consider it, the more I think he needs to have his own voice but in what genre? Psychological Thriller? Paranormal Romance? This is going to be fun. Are you an avid reader who is willing to write a short review of my book? Do you enjoy paranormal fiction? 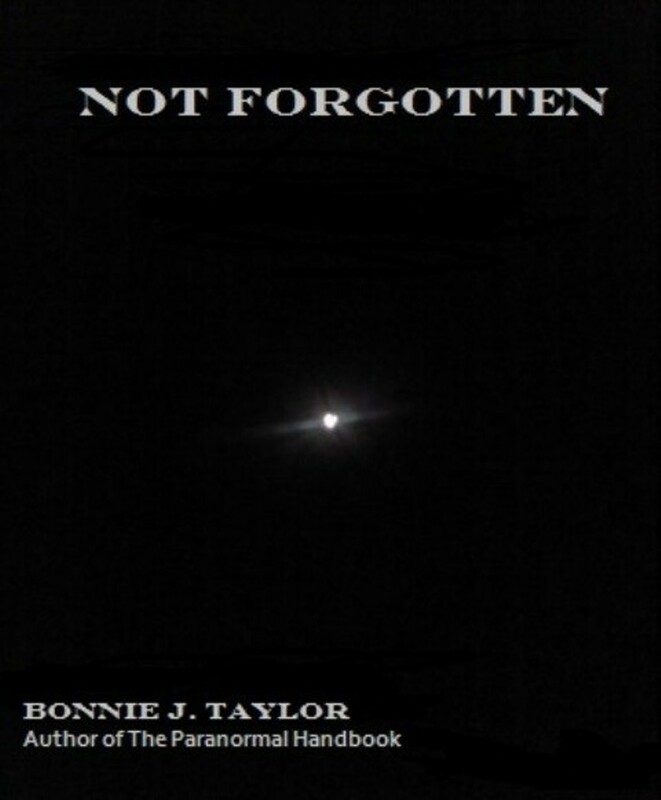 If so, I would love to offer you a free digital copy of "Not Forgotten" in return for your promise to post your review. Please leave me a comment to express your interest and I will forward you the details! What can be said about Jimmy Redbush? He is a man who is completely grounded in the belief that without a connection to the spiritual realm, happiness on the earthly plane is not possible. He is the keeper of great wisdom acquired from his culture and others around the world. He spent his lifetime acquiring this knowledge and uses it to aid and educate those who ask for his help. We will talk more about him later. You can now purchase the e-book on Smashwords, Amazon - Kindle Store, and Barnes and Noble Nook! Check it out! Lilly is a fairly disconnected teenager and tries to have it appear as though her isolation is by choice but it's more appropriate to say that she is the victim of the unfortunate circumstances in her life thus far. As she tells us when she is thinking about attending Karyn's birthday party, she had play dates when her mother was alive but after her death, these organized social events stopped and she became her older brothers tag-along. His death, of course, would have left her very much alone if Kyle hadn't haphazardly stumbled back into her life. Though driven to help her brother, she is reluctant to claim her psychic abilities for fear that they may cause her to be further isolated. Her coming to grips with the reality of her gift is her true coming of age. 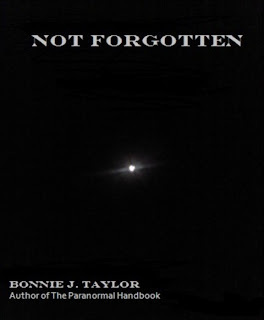 I'm proud to say that the digital editions of my book, "Not Forgotten" are now available for purchase on Amazon for Kindle and in all other digital formats through Smashwords.com.